Stems spreading to 1 m. long; twigs velvety puberulent, sometimes with longer spreading hairs. Leaves opposite, subsessile; petiole 1(–3) mm. long; lamina coriaceous, grey-green to glaucous, ovate, 2–9 cm. long, 2–6 cm. wide, obtuse or rounded at the apex, cordate to amplexicaul at the base, glabrous, with 3–9 pairs of spreading nerves. Umbels 4-flowered; peduncle 1–3 mm. long; pedicels 0–2 mm. long; bract cupular, with a small triangular limb, 2.5–3 mm. long. Calyx cupular, flared, 1.5–2 mm. long, densely hairy. Corolla-tube 3–4 cm. long, dull to dark red, the lobes green, the heads of buds usually darkening before opening, velvety-puberulous to pilose; bud-heads oblong-obovoid to oblong-ellipsoid, rounded and shortly apiculate to a somewhat truncate apex, slightly angular, 4–5 mm. long, 2.5–3 mm. in diameter; basal swelling ellipsoid-globose to globose, 4–5 mm. long, 3.5–4 mm. in diameter; lobes ± 7 mm. long, reflexed, the upper expanded part oblanceolate, 4–4.5 mm. long, 1.5 mm. wide. Style with a neck 2–2.5 mm. long; stigma capitate, 0.8–1 mm. across. Berry red, ellipsoid, 8 mm. long, 7 mm. in diameter, with persistent calyx, pubescent. Upland and riverine forest, extending marginally into Brachystegia woodland, on a wide variety of hosts; 1650–2150 m.
Type:Zambia, Mine Path near Walambo, F.A. Rogers 8353 (K, holotype; B). Receptacle 1–1.5 mm long; calyx 1.5–2 mm long, cupular, flared, densely hairy Receptacle 1–1.5 mm long. Along Congo-Zambezi divide in upland and riverine forest, extending marginally into miombo woodland; 900–2200 m; flowering towards the end of the rains and into the dry season, March to November. 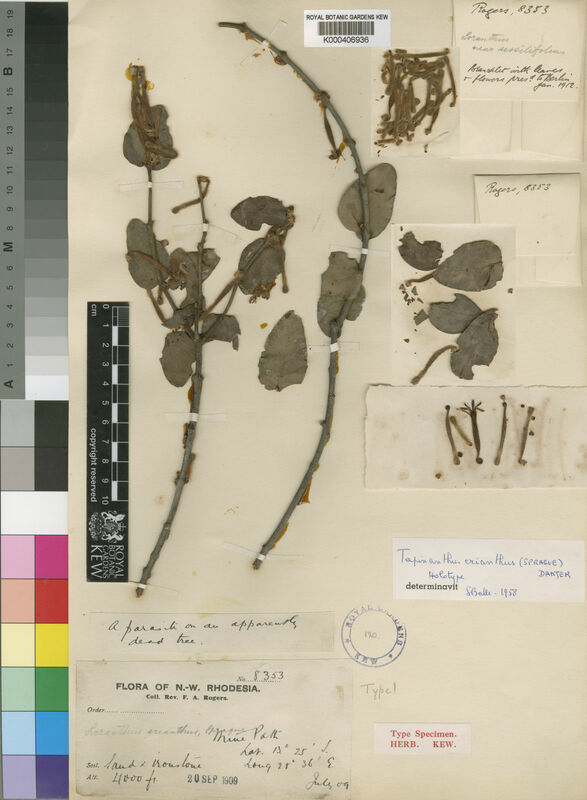 Overlaps the range of T. quequensis in western Zambia and, from herbarium material, extremely similar there apart from the virtually sessile cordate leaves; field comparisons and notes on host ranges would be valuable. Stems spreading to 1 m; twigs velvety puberulous, sometimes with longer spreading hairs. Calyx 1.5–2 mm long, cupular, flared, densely hairy. Style with neck 2–2.5 mm long; stigma 0.8–1 mm across, capitate. Berry red, 8 × 7 mm, ellipsoid, with persistent calyx, pubescent. Berry red, 8 × 7 mm, ellipsoid, with persistent calyx, pubescent. White, Dowsett-Lemaire & Chapman, Evergr. For. Fl. Malawi: 352 (2001). TAB. 35, fig. B. F.T.E.A., Loranthaceae: 76, fig. 11/1, 2 (1999). Verh. K. Akad. Wet., sect. 2, 29, 6: 111 (1933). Danser in Verh. K. Akad. Wet., sect. 2, 29(6): 111 (1933).